Hey Friends! Hope you had a very blessed Easter! Today is the start of a new challenge over at the Craft Hoarders Anonymous Challenge. It's a fun sketch challenge with a twist! Please note: you may change the elements of the sketch design. The flowers can become gears, stars, or a bow. The banners can become buttons or a folded edge. Please feel to rotate or flip the sketch. The sketch is just a guide to your creativity. For the Challenge Rules, please click HERE. You have TWO WEEKS to create a project and enter the challenge. This challenge closes, Sunday, May 4th, midnight PT. One talented participant will receive this prize, donated by Hampton Art! 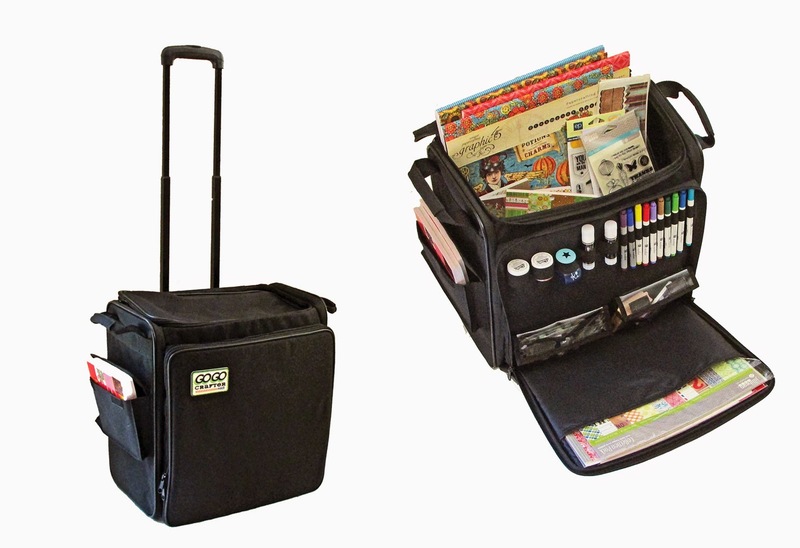 The GoGo Crafter Rolling Tote is collapsible, allowing it to be shipped and stored flat. It comes with two wheels and a sturdy retractable handle for transporting. It also has interior dividers that are adjustable and removable, two interior pockets, three exterior side pockets for supplies, and a zippered front area. This tote can hold enough items for an evening crop or be a helpful "companion" at trade shows or expos. This prize is over a $100 value - product not included! Our sponsor this month is Hampton Art. Hampton Art has been inspiring stampers, crafters and papercraft enthusiasts for over 20 years. One of the earliest “art stamp” companies, Hampton has transformed over the years to become a complete provider of creative products such as stamps, inks, papers, kids crafts, stationery, scrapbooking supplies, and card making accessories for crafters of every age and skill level. For more information, visit our Website. Here is my project for this fun challenge! I went very clean and simple with this sketch! For this card, I used some new to me patterned papers, stamp and punch. My old items on this card are the dies, rhinestones and ribbon. This was a super fun card to make and it was easy, too! See the bottom of this post for specific supplies used in this card! 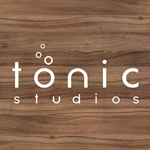 Please visit the other design team members to see their beautiful creations! This month our sponsor is Hampton Art. Hampton Art, founded in 1980 in picturesque Long Island, NY, has been inspiring stampers, crafters and papercraft enthusiasts for over 20 years. One of the earliest “art stamp” companies, Hampton has transformed over the years to become a complete provider of creative products such as stamps, inks, papers, kids crafts, stationery, scrapbooking supplies, and card making accessories for crafters of every age and skill level. Hampton Art ahs a portfolio of brands including Hampton Art™, Studio G™, Diffusion, Ditto™, and our latest addition, Ki Memories®. Their products can be found via most national craft retailers at over 5000 stores across the US and Canada. They also ship to 20 different countries across the globe. For more information, visit their Website. Here is my project using some beautiful Hampton Art clear stamps!! The stamp set I used is called Carpe Diem by Hampton Art. Its a clear stamp set so that made it super easy to stamp the background on the Baja Blue cardstock using Baja Blue ink. The birds were stamped on ivory cardstock using Rich Cocoa Memento Ink and cut out. The sentiment was stamped onto a Labels 28. While the cardstock was still in the die, I used a sponge to add color around the edge of the die. Then I stamped the sentiment. I layered that onto a Decorative Labels 28 in the blue and kraft cardstocks. I added some white seam binding and a couple of white paper roses that I sponged with the blue ink, also! To finish off the card, I added pearls in the corners and stickles to the birds! This was a fun card to make. I love to stamp and that is actually how I got started in this crazy crafting world! Sometimes it is so great to just create for fun, isn't it? Plus I used some of my crafty hoard!! You have until April 20 to participate in this fun stampers challenge! Be sure to link up your project HERE on the Craft Hoarders Anonymous Challenge Blog. Remember to check out all the wonderful and talented ladies on the Craft Hoarders Anonymous Design Team.....they have made some awesome projects! Here is the Craft Hoarders Anonymous Challenge Blog Design Team! cardstock - Kraft, Baja Blue - SU! Ink - Rich Cocoa Memento Ink pad; Baja Blue- SU! RRR & Hampton Arts Breast Cancer Awareness Blog Hop! Hello and welcome to the Really Reasonable Ribbon and Hampton Art Breast Cancer Awareness Blog Hop! The RRR DT has joined up with the Hampton Art Dt to show you a bunch of fantastic projects using Really Reasonable Ribbon and Hampton Art products! Special thanks to Hampton Art for sending me Stamps and Ink to use for this hop. If you are following along with the hop, you have come from Linda's Blog. If not, please to to the Really Reasonable Ribbon blog or to the Hampton Art Blog to get started! You don't want to miss a stop along the way with this hop....there are some beautiful projects. For my project today, I made an accordian card using lots of RRR ribbon and trims plus a wonderful stamp set from Hampton Art called Carpe Diem. This is a clear stamp set with 14 stamps in the Art Warehouse line from Hampton Art. 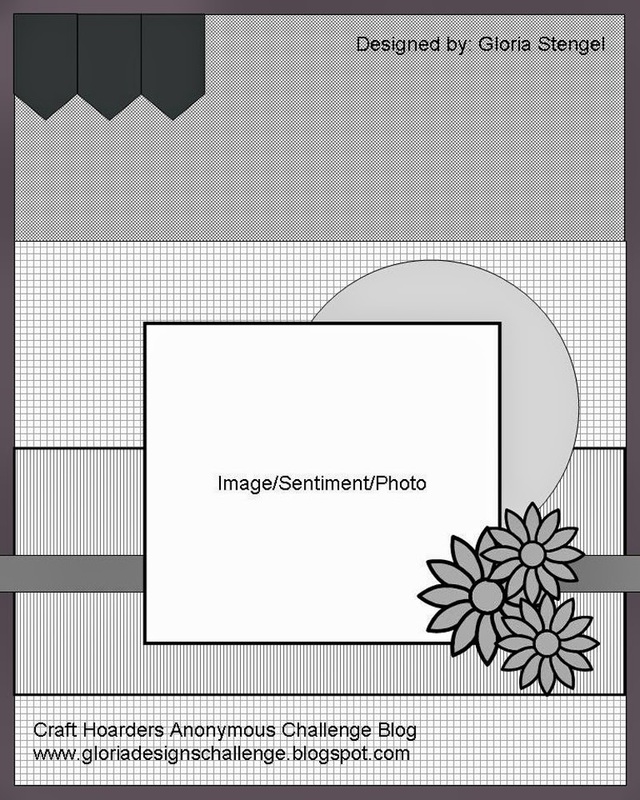 Here is my accordian tag card. This accordian tag card measures 5 1/2" x 10" and is scored at every 2 1/2". I actually did this in 2 panels so I could cut the top of each panel using a die from the Creative Book pages set from Spellbinders™ Paper Arts. This is called selective cutting and I can show you this technique in another post if you are interested. I stamped all over, didn't I? These clear stamps are really high quality, taking ink very well and were fun to use! These words are actually 3 different stamps that I put together. I stamped them onto some Simply Smooth Ivory using Rich Cocoa Memento ink. Then I used on oval die template to cut/emboss this. I sponged the edges with Antique Linen Distress Ink and layered it onto S5-030 Fancy Tags Two that I cut/emboss from pink cardstock. I used the Antique Linen Distress Ink on almost every edge of this project. I stamped the bird using Victorian Velvet Distress Ink and fussy cut it out adding stickles after everything was finished! Those beautiful pink rhinestones are also from Hampton Art Studio G line of self adhesive gems. Ok now that you have enjoyed my project, its time to go to your next stop! Please hop on over to Gini Cagle's blog! Have a fun time checking out all the Really Reasonable Ribbon and Hampton Art goodies along the way! There will be a prize with a value of approximately $20 offered on both the Hampton Art Blog and the RRR blog so make sure you comment on all the stops so you are entered to win these great prizes.